If you are planning a Tibet trip, you must need to know some details about it. A professional guidebook has been prepared well for you by sorting these details out. Many international travelers are confused by a question: what does the name - ‘Roof of the World’ come from? In fact, this nickname of Tibet can be explained well by its height. As the highest plateau in the world, the average altitude is more than 4,500 meters. The size of Tibet is large as five times as France, about 2,500,000 square kilometers. Having a Tibet trip is a challenge for most travelers. The scenery of Tibet is different from other areas in the world. Here, the peaks of grand mountains are capped by white snow, the roads are wriggling on the valleys, and the sky is mirrored in the green lake. Travelers leave a deep impression on Tibetan people because of their faiths, especially those pilgrims who have walked for a long distance from the remote villages. Traveling is the best way for people to get close to nature, traditional culture, and local people. From the exploration, you can gain a lot of knowledge outside the books. You can feel the real world. If you decide to have Tibet trip, you will know about the Buddhism, Himalaya mountains, Potala Palace and other famous scenic sites. Foreigners mustn’t travel to Tibet on their own. 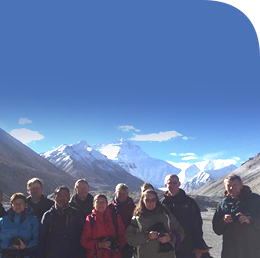 The only way to get into Tibet is to join a tour group arranged by travel agencies. By contacting with your travel agency, you can get your Tibet Permit issued by Tibet Tourism Bureau. No permit is needed unless you are Chinese, Taiwanese and Hongkong travelers. Only relying on the Tibet Permit, you are allowed to take flights and trains, visit Tibetan scenery spots, and join some activities. Travelers from Singapore, Brunei, and Japan don’t need to deal with Chinese visas but should have Tibet permits. Travelers from other nations not only do they need Chinese visas, but also they need Tibet Permit. You should get the Chinese visa a month early, then your travel agency can get the TTB permit for you. From April to October, it is the best time for tourists to have a Tibet trip. The climate in this period is fine enough for visitors. You don’t have to worry about the cold and rain. Besides that, there are many festivals held in this period, such as Saga Dawa Festival, Shoton festival, and Nagqu horse racing festival. In winter, there has a low traveler flow in this period because of the chilly weather and the heavy snow. You ‘d better not visit Everest Base Camp because the temperature is under 0 degree. In Tibet, international visitors can’t take public transport when traveling around. If you join a tour, you can travel around by vehicles arranged for you. But when you want to visit Lhasa’s markets and old towns, you can visit them on your own. Only in tourist spots, you need be accompanied by tour guides. You can just spend 10 yuan for one - way trip in Lhasa. In the heart of Lhasa and Shigatse, tourists can stay in 4-star hotels where provide qualified equipment and comfortable service. Such as Lhasa Gang-Gyan Hotel and Tashi Choeta Hotel in Shigatse. You can also have an experience of camping at Everest Base Camp. Each camp can contain 5 to 8 people, and the mattresses and the quilts are clean and comfortable. If you feel cold, you can spend US$10 in buying a sleeping bag. Apart from camping, tourists can also stay in the local families. The costs of family houses are low, and travelers can have a better understanding of the local customs, food, manners and so on. There must be a regret for international tourists who haven’t reached Everest Base Camp. Seeing from the camp, you will have a whole sight of the highest mountain in the world. Lying in the camp, you must feel like touching the sky and sleeping on the clouds. Sera Monastery debate is an unforgettable experience. Here, you will be astonished by the monks’ understanding of Buddhism. The debate is hot and interesting. The most famous place in Tibet is Potala Palace. Tourists can never miss the landmark of Tibet, the home of Dalai Lamas in the past, and the modern museum at present. A lot of attractions in Tibet are worth being visited like Jokhang Temple, Barkhor Street, Samye Monastery, Lake Yamdrok and so on.